West MacDonnell National Park | West MacDonnell national park is a vast and spectacular section of the MacDonnell Ranges and an outstanding example of an ancient landscape sculptured over time by climatic elements. 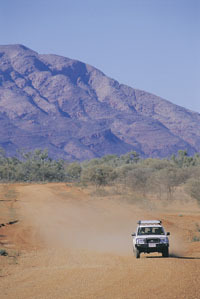 The West MacDonnell (Tyurretye) National Park stretches some 161 km due west of Alice Springs. There are cool scenic gorges being mportant refuges for plants and animals, many of which are found only here and some are relicts of a bygone era of tropical forests such as Palm Valley. Click here for detailed links on Uluru, Kakadu, Alice Springs, Darwin and all area in between. West MacDonnell National Park travelling to there | From Alice Springs car, campervan and motrhome access to the Park is via Larapinta Drive and Namatjira Drive. From Watarrka National Park (Kings Canyon) the unsealed Red Centre Way (4wd access recommended) connects to West MacDonnell National Park. Simpsons Gap is also accessible via a 17 km sealed bicycle track which starts opposite Flynn’s Grave, 7 km from Alice Springs along Larapinta Drive. West MacDonnell National Park access | is accessible nearly all year round. The cooler months (April to September) are the most pleasant. All roads can be impassible for short periods after heavy rain. 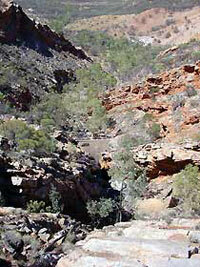 West MacDonnell Ranges Camping | Camping - Ellery Creek Big Hole and Redbank Gorge provide basic facilities. Serpentine Chalet and 2-Mile (4WD only) provide camping sites with no facilities. 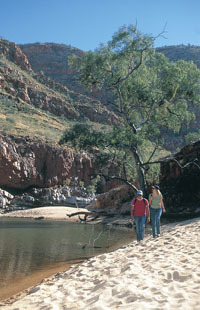 Ormiston Gorge provides camping facilities including showers and flush toilets. Camping fees apply and are payable at each camping area. 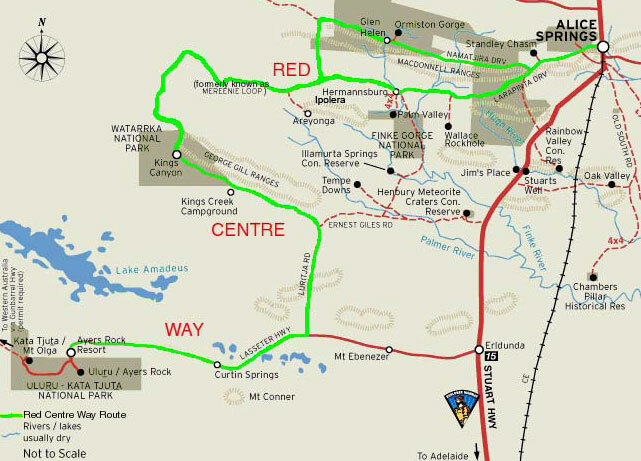 Overnight visitors to the West MacDonnell National Park are required to bring their own water supplies. All tank water in West MacDonnell national park should be treated before drinking. Fireplaces are provided at some sites, however most sites offer free gas BBQs to replace open fireplaces (refer to map). At Serpentine Gorge all fires are prohibited in this special zone. Commercial facilities are available at Glen Helen Resort, including caravan sites and motel accommodation. West MacDonnell National Park walks and treks | Walking - a good way to experience the spectacular views in this Park is by walking. The 223 km Larapinta Trail stretches through the Park and offers extended and overnight bushwalks for fit, experienced and well prepared walkers. • www.australia4wdrentals.com with over 30 types 4wd's with camping gear, 4wd campers, small campers to budget and premium 2wd 2-4-6 berth motorhomes hire. • Binns Track - The Binns track covers 2191km and winds through many of the Northern territory Australia's lesser-known nature reserves and National Parks. • Glen Helen Lodge accommodation start of the Mereenie Loop region must book ahead. • Hermannsburg known for a famous artist West MacDonnell Ranges. • Explorers Way - from Alice Springs to Darwin section 1500klm approx. • Stuart Highway - from Alice Springs to Darwin section 1500klm approx. • Katherine Gorge just outside of Katherine around 24klm - it's a must Things To Do list experience. • Devils Marbles - Majestic whole and spilt boulders on the side of the road near Tennant Creek. • Alice Springs the heart of the centre of Australia on the Explorers Way and The Stuart Highway made famous in a number of movies and the gateway to Uluru, Kata Tjuta and Kings Canyon, East MacDonnell ranges and West MacDonnell ranges. • Coober Pedy the Opal Capital of the world as some say. Opal is a precious stone so visit and go fossicking and noodling as they say and find your riches. Kakadu, Katherine Gorge and Litchfield so explore and visit waterfalls, ancient rock art, aboriginal culture, bushwalks, gorges, swimming holes, crocodile sightseeing cruises. • Natures Way in Northern Territory is basically Litchield, Katherine and Kakadu all 3 natural ancient wonders of the 'Top End' in one big 5 day experience loop trake a tour or self drive in a campervan hire or 4 wheel drive rental. • Litchfield National Park in Northern Territory Australia a day visit or part of a Top End 3-5 day tour or self drive trip. • 4WD Hire from Alice Springs with oneway to Darwin, Perth, Adelaide, Sydney, Brisbane, Broome, Melbourne or return to Alice Springs. Book your tours online and enjoy instant confirmation after your secure payment. In a hurry and dont wish to wait this is excellent for booking right now. 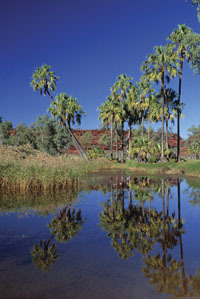 • Other Litchfield National Park day sightseeing tours from Darwin.